Our daily life is powered by energy. Smartphones, computers, public traffic, street lights, machines and factories, cashier systems – everything depends on energy supply. More specifically: electricity. If you ever had a low battery on your iPhone and no plug socket anywhere in sight, you know what I am talking about. Electricity is the oxygen of our economy. Looking at emerging markets like China or Africa, they are striving to achieve a comprehensive electricity supply in order to stimulate growth, create value and thus, wealth for their country and their people. Historically, the electrification of Europe has given us a head start into an early industrialisation of our continent resulting in Europe being best-in-class in many fields for decades. Innovation, development, ideas – Europe was always ahead of the game. Energy has been and still is a deciding factor in international competition. Currently, we see the shale gas boom in the USA shaking up not only energy markets around the world. The close connection of gas and oil prices and the need for oil as a base material for whole industries makes new businesses and breaks others. We see the economy of China skyrocketing and the prosperity of billions of Chinese people rise to levels nobody would have imagined. Electricity opens up new possibilities. In Europe today, we are taking a stable electricity supply for granted. Power is no “design product” that we long for or swoon over in front of stylish department store windows. Power is just “there” – whenever we need it. But power is a very delicate product. It cannot be stored (only in minor amounts) and thus needs to be produced exactly when needed. When you switch on the lights at home you expect them to burn bright that same split second. In economic terms, you would say: Demand needs to be met in real time. This problem often has been solved by installing monopolies for energy supply or making energy supply a state owned business. Many countries have followed this route in the past. In the EU, we have a liberalised market since 1998 promoting the competition of different generation technologies to ensure a stable and affordable electricity supply. But energy supply always needs to serve three masters at once: It is a goal conflict between security or reliability of supply, affordability and sustainability. 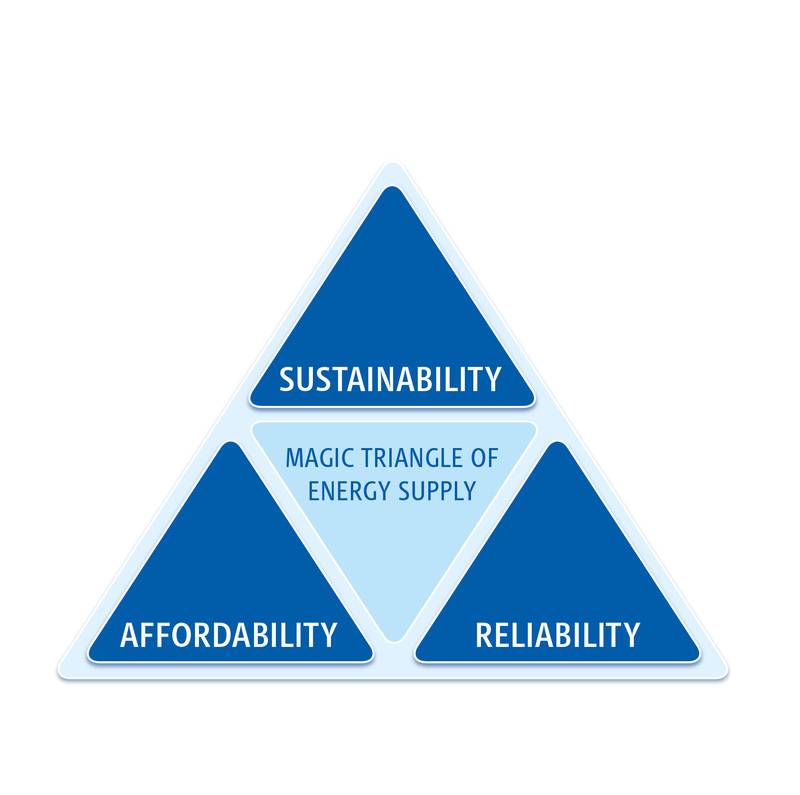 This goal conflict is called the “magic triangle” of energy supply. In emerging markets you can see that reliability of supply is the primary goal to ensure stable electricity supply for emerging economies. When the economy develops, you see the efforts shifting more to the angle of affordability to optimise production and increase private wealth. Sustainability is the last factor to enter the magic triangle in developing economies and comes with the will to create endurable and lasting structures beyond finite resources. The most difficult task is to keep the three different “angles” of the triangle in a balance. If one aspect is over-emphasised, the other aspects will suffer. 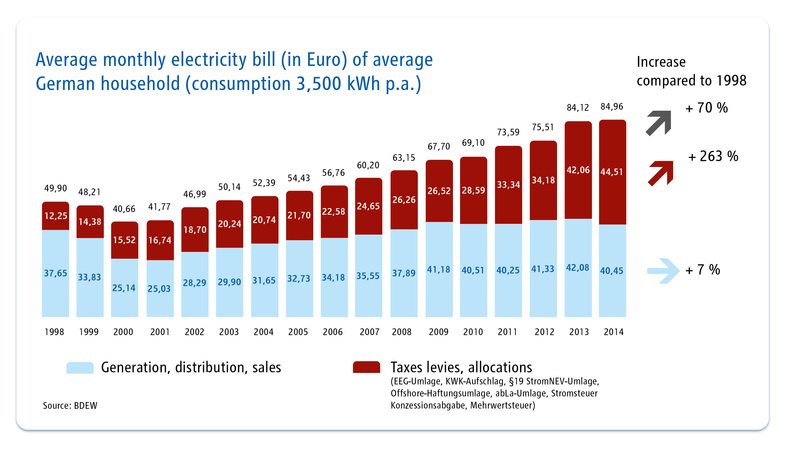 We can see this currently very clearly when looking at the European electricity market. During the last decade, there has been a lot of politically and socially driven promotion of renewable energies. Germany has got one of the most successful yet costly renewable promotion schemes. 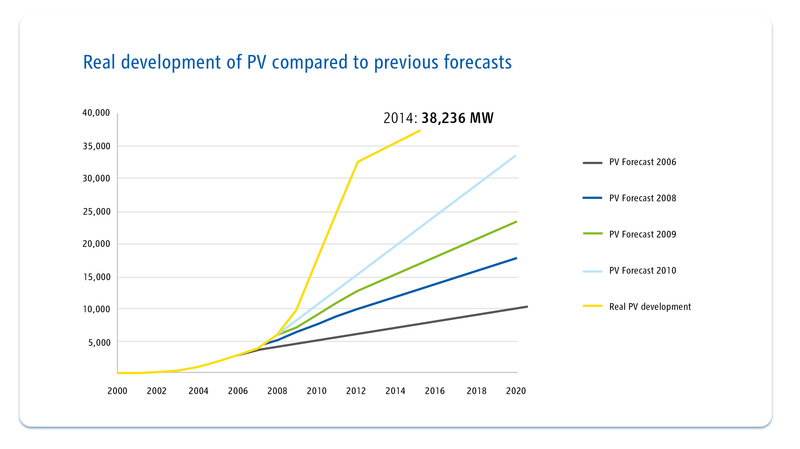 We have seen a tremendously rapid growth of installed capacity especially in photovoltaics. This development had not been foreseen by anyone, even the German government itself (who enacted the according laws) had not anticipated such an increase (see figure 2). Due to the European power market functioning by marginal costs per generation unit, renewable energies with marginal costs of zero have turned the European power market upside down. As the German renewables act EEG stipulates a feed-in priority for renewable energies, they have led to a dramatic drop of whole sale power prices in Europe. Many conventionally fired power plants – especially gas fired ones – are no longer economically viable. Mothballing or decommissioning of capacity has been the result. Currently, this does not affect security of supply as there have been overcapacities in the market. But we need to take into account the nuclear phase out in Germany. Large capacities will be taken out of the market and pundits say that we are running the risk of shortages by 2022. Security of supply is a public good and every economy needs to decide how much value it attributes to it. For industrialised countries like in Europe, security of supply is the basis of a prosperous industry. A prosperous industry is the basis for employment. And employment with competitive wages is the basis for consumption and national welfare. Industrialised countries have a need for security and affordability of energy which cannot be provided without conventionally fired power plants. With lignite, we have a subsidy-free, domestic primary energy source in Germany ensuring security and affordability at the same time. And with the European emissions trading system we have a tool in place to keep the balance with sustainability within the magic triangle. But also lignite-fired power plants are under heavy financial pressure, aggravating the situation even more. Is there a cure for this sickness? Yes, there is. Many countries have already implemented so called capacity mechanisms. They work like an insurance. Power plants are paid for holding capacity available and jumping in when the wind is not blowing and the sun is not shining. There is a multitude of possibilities how to design such a mechanism. From a macro-economic point of view one should certainly avoid subsidies. But there are proposals based on market mechanisms. Firm capacity could be marketed in the same way as produced kilowatthours currently are. This has got nothing to do with life-sustaining measures for the methusalems of plant. The market will automatically favour the most efficient technologies. Thus, we kill three birds with one stone: Security of supply is ensured, costs are being held low and overcapacity is prevented. At the end of last year in the UK, the first capacity auction was successfully concluded at prices lower than expected by most. Are we already at this point? Is a transformation of the energy landscape even possible under these circumstances? Are there any chances to hold on? A new energy landscape does hold many chances. Firstly, we all agree that we need to protect our planet and carefully handle our natural resources to allow for further generations to live in health and prosperity. This means we have to take sustainability seriously. But how can we all benefit from that? A major trend in the energy landscape is the decentralisation of production. Electricity production is no longer limited to large power plants operated by big companies. Photovoltaic panels enable every one of us to produce his or her own electricity. Especially for rural areas, this makes a huge difference. Consumption and production in one hand create the “prosumer”. This development shifts the value of generation towards the end user – one could call it a “democratization” of energy supply. Moreover, competition is increased and leads to a natural market clearing. An important factor is the increasing electrification of areas formerly being driven by other “fuels”. The spread of electronics and digitalisation lead to higher power consumption. Also, the heat and the traffic market as well as public services and modern mega cities ask for more and more power. Global electricity consumption will increase by 93 per cent between 2010 and 2040 according to the US Energy information administration. This growth fosters innovation and the development of new business models. The famous US physicist Michio Kaku predicts that superconductivity at room temperature will pave the way into a completely different energy future. Currently, superconductivity is possible at high sub-zero temperatures. RWE is one of the pioneers in this technology having installed the longest superconductivity cable in the world in Essen. But after all it all comes down to one thing: money. Investments into the energy sector are needed to stimulate innovation. To meet the growing electricity demand, roughly 17 trillion US dollars of investments are needed in electricity supply infrastructure in the next 20 years, estimates the International Energy Agency. In order for this amount of money to be brought underway, returns on investments need to be absolutely clear. But currently, analysts declare large parts of the energy sector as “uninvestable”. If we succeed in creating political frameworks allowing for robust and viable business models, we have the historical chance to give our global economy a sustainable footing and thus increasing prosperity and opportunities for people around the world. Dr. Bernhard Günther was born on 8 January 1967 in Leverkusen, Germany. He took his Master’s degree in Economics in St. Gallen. While working as a Management Consultant at McKinsey & Company, he completed his doctorate in economics. Bernhard joined RWE in 1999 where he held various managerial positions before becoming Managing Director and Chief Financial Officer of RWE’s Gas Supply and Trading business in 2007. In July 2012, Bernhard became a Member of the Board of Directors at RWE AG and was instated as Chief Financial Officer of RWE AG in January 2013. During his time in St. Gallen he was an active of ESPRIT St.Gallen.